Listen to the sounds of the jungle! It's winter and time for a vacation. Let's head to the Amazon! With names like the Screaming Piha, the Blue-crowned Motmot, and the Black-necked Red-Cotinga, these are not your average birds. Insects are the background chorus for the Cuvier's Toucan and the Musician Wren. If you want to get away to it all, consider an ecotourism trip. It’s winter and time for a vacation. 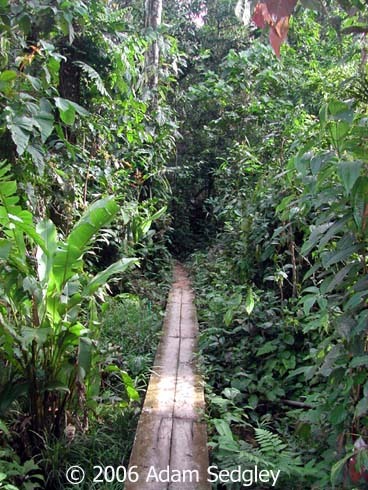 Let’s head to the Amazon! So many birds. What are the sounds we’re hearing? [Blue-crowned Motmot] And, that hooting sound? That’s from the Blue-crowned Motmot. [Black-necked Red-Cotinga] There’s the saucy cry of the Black-necked Red-Cotinga. And those continuous sounds? [Sound of insects] Those are insects. [Cuvier’s Toucan] Oh, now we’re hearing the call of a Cuvier’s Toucan and the growl of a howler monkey [Howler growl]. BirdNote invites you to sit back and enjoy the sounds of the Amazon. Amazon bird chorus provided by The Macaulay Library of Natural Sounds at the Cornell Lab of Ornithology, Ithaca, New York, recordist info not provided.